Mere days after the Samsung Galaxy Fold foldable phone was officially revealed to the world comes a see-all mega leak that appears to unveil Huawei's rival foldable phone, the 5G Huawei Mate X. 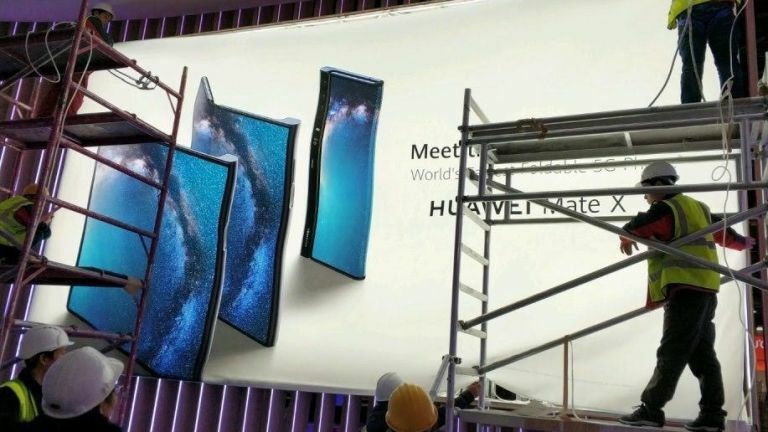 The Huawei Mate X was apparently accidentally revealed when one eagle-eyed Twitter user happened to pass a new billboard installation and was surprised to see the much-hyped new folding phone in see-all detail. Assuming this is not a very elaborate fake, the Huawei Mate X billboard shows the foldable phone off both in phone mode and in tablet mode, and is accompanied by a couple of lines of text. The first line is, unfortunately, obscured but the second line is almost completely visible and appears to read: "World's Fastest Foldable 5G Phone". The world's fastest foldable 5G phone would seem to indicate that the Huawei Mate X device will beat the 5G Samsung Galaxy Fold model in terms of speed, however it is unclear whether that means the 4G or 5G versions of the South Korean-made folder. Regular readers of T3 will know that we have reported on Huawei's folding phone since the middle of last year, with those rumours turning into a very real device just three weeks ago in a teasing MWC invitation that showed a folding device with the slogan "Connecting the Future" above it and the date of 24.02.2019. The 24th of February is tomorrow and T3 will be in residence at Huawei's much-anticipated press conference to see what now seems will be the launch pad for the Mate X folding phone, which from what we can see from this billboard leak looks set to be a serious Samsung Galaxy Fold rival. We're incredibly excited! Check back in to T3.com tomorrow for the full Huawei Mate X picture live from Mobile World Congress 2019.